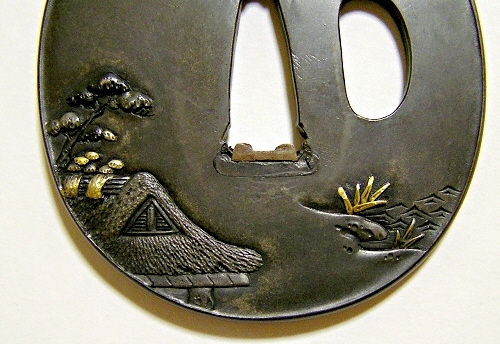 You can know this tsuba was made with many techniques. Shibuichi (alloy of copper 4 and silver 1 ) is also called "Rogin" in Japanese. The word means alloy metal that emits faint moonlight. 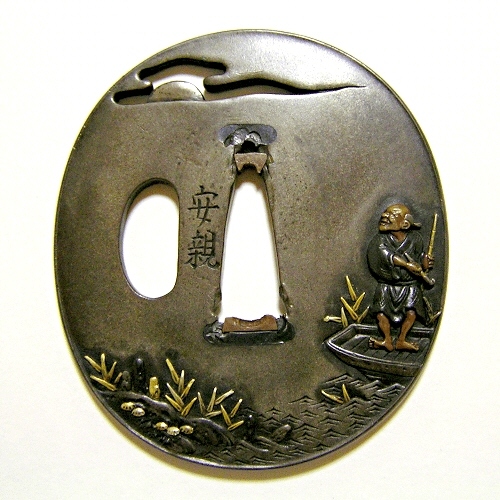 The composition of this tsuba is a fisherman under the moon. The tsuba craftsman chose very suitable alloy metal. And also the surfaces are burnished well (Migaki-Ji) to depict the moonlight more artistic. The moon is expressed in Sukashi openwork technique. 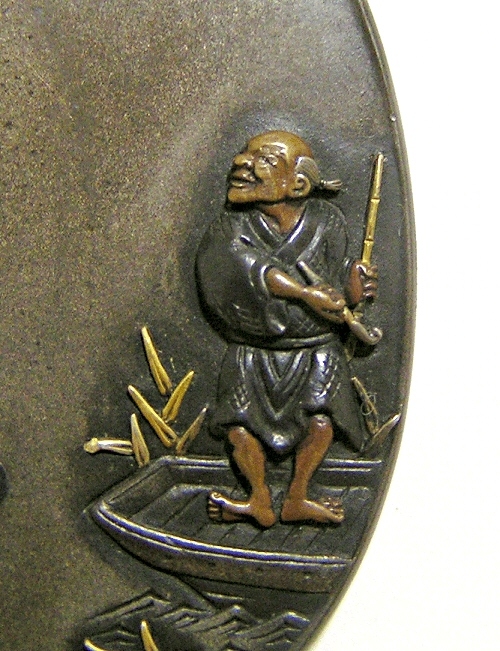 And the fisherman is expressed in Takabori (High relief carving) and Zogan (Inlay) and Iroe (Very advanced metal brazing technique) methods. Amazingly, you can see the man is enjoying the moonlight as his face was chiseled to the details. Yasuchika (1670 - 1744) is very important craftsman in Japanese tsuba history. The patriarch of the Tsuchiya school in Edo area (=Now Tokyo). Son of Tsuchiya Chuzaemon of Shonai Domain in Dewa Province. Studied metal-carvings under Sato Yoshihisa. Went to Edo in 1703 and studied how to make tsuba under Nara Tatsumasa. Finally, he gained independence from the Nara school and earn much fame. He aquired various methods for making tsuba. Good at expressing men with very elaborate techniques. 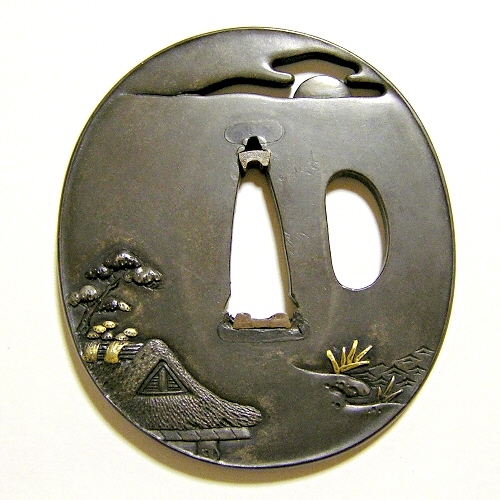 This tsuba is made of Shibuichi (alloy of copper and silver). This alloy metal is also called "Rogin" in Japanese because it emits faint moonlight. 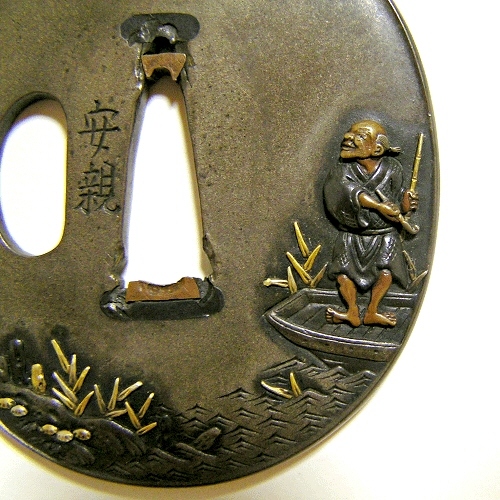 Iroe technique is used for this tsuba. Iroe is very advanced metal brazing technique. The motifs are expressed in high relief carving.